Look, I don’t want to dwell on this too much. I’m not sure there’s anywhere to take it, and I’m a natural skeptic with these theories, anyway. I’m not sure why the World Series baseball would feel unusually slick, and, even if it’s true that it did, well, both teams got the same baseballs. You adjust and you deal. The Astros won one more game than the Dodgers did. Every single baseball game is played under its own unique conditions. The Astros are the rightful champions, and the Dodgers are the rightful runners-up. But there’s always going to be that what-if element. It would be there anyway. What if Clayton Kershaw started Game 7, instead of Yu Darvish? What if Cody Bellinger had actually walked off Game 2? What if Yulieski Gurriel had been suspended immediately, instead of having it delayed until 2018? What if a million things. Baseball seldom makes it clean. What if there truly was something weird about the ball? What could’ve happened if there weren’t? There’s no closure to be found through entertaining these questions. The games will never be replayed, and the Astros will stand as the 2017 champs forever. I just wonder. I see the argument against the ball being different. I made it just the other day! And yet, I’m not sure how to explain Brad Peacock. Peacock made the World Series roster. That’s one of those obvious statements that would’ve seemed strange eight or nine months ago. And not only did he make the roster — he pitched in four games. I wouldn’t say he was perfect, but he got 11 big outs in Game 3, and he got six big outs in Game 7. Peacock was one of few pitchers who had the trust of A.J. Hinch, and so he played a major role in the Astros’ title push. Peacock, this year, was outstandingly good. It’s why he pitched in the playoffs. It’s why he pitched in Game 7. For most of the year, he was a starter, and in the World Series, he was a reliever, but that’s not a mark against Peacock; the Astros simply have too many good starters to start. How effective was Peacock during the regular season? There were 134 different pitchers who threw at least 100 innings. Peacock ranked 10th among them in wOBA allowed, at .274. Dallas Keuchel allowed a wOBA of .273. Rich Hill allowed a wOBA of .280. Peacock was great. Why was he great? In part, it’s because he was the healthiest he’d been since 2011. And in part, it’s because he leaned on a terrific new slider. He threw it almost 40% of the time. It comes with a fun little origin story. Peacock primarily was a fastball-changeup-curveball pitcher in 2013-14 for the Astros, but now throws his slider more than 35 percent of the time and has a batting average against of .201, much of that due to the slider. Peacock learned his slider from Jordan Jankowski. He’s since passed it along to Collin McHugh. You never know what little tweak might make the difference. Peacock got better as a member of the Astros, but it wasn’t exactly the Astros’ organizational doing. He just picked something up from a teammate. Peacock’s slider this year had one of baseball’s higher slider-specific run values. It was comparable to the sliders thrown by Kershaw and Darvish. None of this was any secret. Every pitcher has his obvious strengths. Every pitcher pitches to his obvious strengths, when the season is on the line. Lance McCullers obviously never shied away from his curveball. Peacock liked his slider, and he leaned on his slider. Then he pitched in last week’s Game 3. Of his 53 pitches, just six were sliders. All right, that’s one game. One blip. Peacock appeared again in Game 5. Of his 39 pitches, just five were sliders. And then there was Peacock’s Game 7 appearance. Of his 37 pitches, just three were sliders. Now, granted, one of those sliders was terrific. For the most part, though, Peacock continued to work off of his fastballs. Overall, combining Peacock’s last three games, he threw 129 pitches, with only 14 sliders. That’s a rate of about 11%. 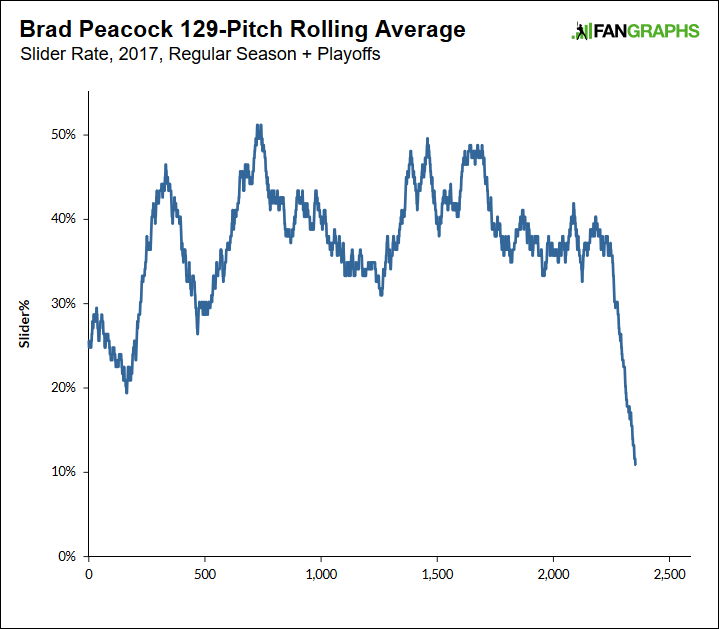 This is how Peacock’s 2017 season looked, in terms of rate of sliders thrown over rolling 129-pitch averages. Peacock never threw sliders close to so infrequently. There’s one slight early dip just below 20%, but he put that behind him in a hurry. Peacock spent almost the entire rest of the year over 30%. He did what good pitchers typically do — he made frequent use of his best weapon. And then, in the World Series, he suddenly stopped. When I examined this slick-ball theory the other day, I found that, overall, pitchers weren’t staying away from their breaking stuff. Just yesterday, Kershaw threw plenty of sliders. Darvish also kept trying to make the slider happen. I find that to be pretty compelling and pretty convincing. But Darvish’s slider in particular was dreadful in the series, almost incapable of missing any bats. The question is going to linger. You could say it’s possible that, in the series, Peacock just didn’t have a feel for his slider, so he didn’t want to use it. Sometimes pitches go through slumps. But *why* might he not have had a feel? Why did Brad Peacock choose the World Series, of all times, to hardly use the pitch that got him on the roster in the first place? It’s not like the Astros were just trying to make the Dodgers confused. It’s not like Brian McCann had McCullers throw way fewer curves. The Peacock point is bizarre. Maybe it’s nothing at all. Maybe he just had an atypically lively fastball. When you search for anomalies, you can usually find some, and that doesn’t necessarily make them meaningful. It seems a little silly to be thinking about Brad Peacock today, after all that the Astros have accomplished over all of these years. But Peacock is in my head, now. Maybe the World Series baseballs really were unusually slick. Who knows what that could’ve meant for Darvish. Who knows what that could’ve meant for the outcome. Nothing is ever going to be reversed. Nor should it be. And, in the end, credit to Peacock, who played a major role while hardly using the pitch he throws best. I’d like to see Lance McCullers try *that*. We hoped you liked reading Maybe There Really Was Something Up With the Ball by Jeff Sullivan! Now we need to know if slick balls will be used in 2018.